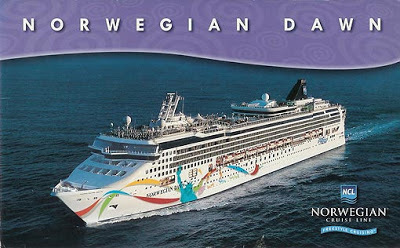 For the past several weeks the Norwegian Dawn, sailing to from Boston, was forced to stay anchored just outside the Kings Wharf Docks in Bermuda. Her passengers were ferried to the pier. The Norwegian Dawn was displaced by workers perparing and strengthening the pier where Norwegian Cruise Line's new Norwegian Breakaway docked yesterday. The new 146,000 ton, 1,060 foot long ship required special enhancements to the pier to handle a ship of its size. For the past few months, rumors were circulating that the pier work would not be completed in time and that the Norwegian Breakaway would need to anchor a mile offshore from the pier and ferry in passengers OR actually change the itinerary for the maiden voyage to Bermuda - calling elsewhere. 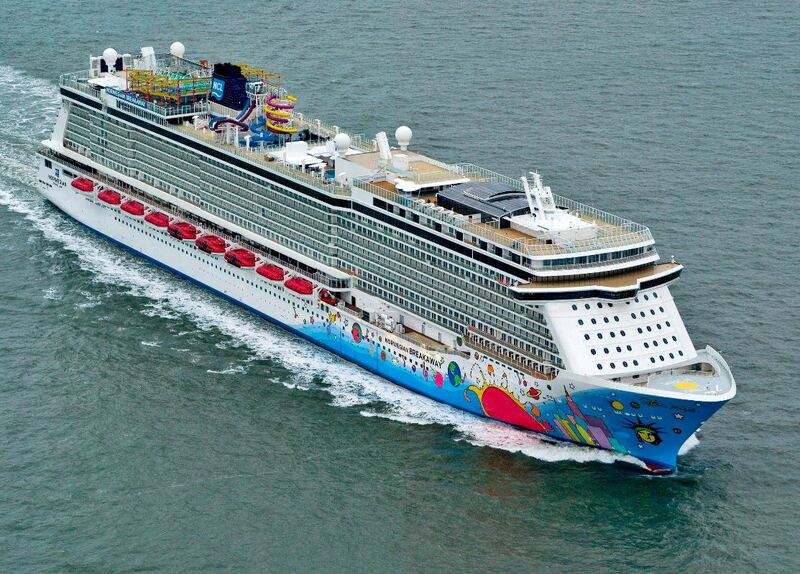 Fortunately this was not the case and the Norwegian Breakaway successfully docked there yesterday. 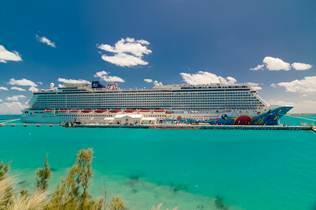 Norwegian Cruise Line's New Norwegian Breakaway Makes Maiden Call At Bermuda. HERITAGE WHARF, BERMUDA – May 15, 2013 – Norwegian Breakaway, Norwegian Cruise Line’s newest ship that is making headlines as a “game changer” for the cruise industry, today made her inaugural stop in Bermuda, on her first seven-day voyage which departed New York on Sunday. Carrying 4,000 guests, Norwegian Breakaway, the largest ship to ever port in Bermuda, docked at Heritage Wharf at approximately 8 am local time. Bermuda’s Premier Craig Cannonier and local officials greeted the ship and Captain Evans Hoyt amidst much fanfare. The 146,600 gross ton ship was christened on Wednesday, May 8 during an exclusive ceremony featuring Premier Cannonier, New York City Mayor Michael Bloomberg, New York City icons The Rockettes®, Chef Geoffrey Zakarian, and Master Baker Buddy Valastro, star of TLC’s “Cake Boss,” among others. Her signature hull art featuring a large sun, planets and the New York skyline was designed by legendary artist Peter Max. occupancy. Norwegian Breakaway spends three days in Bermuda and offers more than 30 unique shore excursions. Guests can go reef fishing at night, bike the original Bermuda railway trail and explore the spectacular scenery by paddleboard. Norwegian Breakaway guests will also have the opportunity to experience several excursions exclusive to the ship, including the opportunity to explore Bermuda’s natural beauty and hidden treasures in a more personalized setting and at their own pace with a private boat tour. Beginning October 13, Norwegian Breakaway will offer seven-day voyages from the heart of Manhattan to the Bahamas and Florida, as well as two 12-day sailings to the Southern Caribbean. This past week we saw the return of the return of several regular ships back to the port of New York. 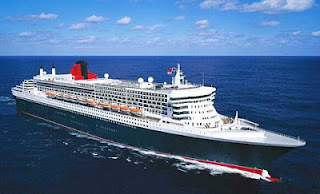 Cunard's Queen Mary 2 returned to New York on May 3rd and docked at the Brooklyn Cruise Terminal. 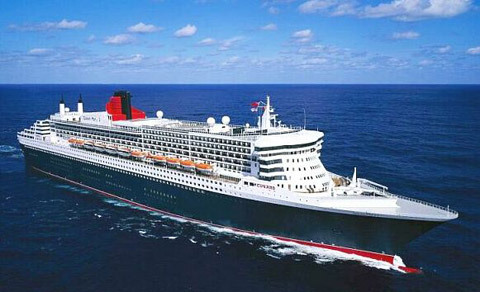 After completing a transatlantic crossing, ending to her world cruise, the Queen Mary 2 turned around 11 hours later and sailed full speed back to Southampton, England. Celebrity Cruises' Celebrity Summit returned to Port Liberty, Bayonne, New Jersey on May 4th for her Spring, Summer, Fall cruises to Bermuda and fall sailings to New England/Canada. Norwegian Cruise Line's New Norwegian Breakaway arrived in New York on May 7th. The Norwegian Breakaway will be sailing 7-day cruises from New York to Bermuda and fall and winter cruises to Florida and the Bahamas. In addition, Norwegian Cruise Lines' Norwegian Gem (to Florida and the Bahamas), Royal Caribbean's Explorer of the Seas (to Bermuda or Florida and the Bahamas) and Carnival Cruises Carnival Splendor (to Florida and the Bahamas) are sailing full swing from the port. May 8, 2013 – Norwegian Cruise Line’s newest ship, Norwegian Breakaway, was christened by the legendary Rockettes® during a ceremony officiated by Mayor Michael Bloomberg and Cardinal Timothy Dolan. Buddy Valastro, star of the TLC series “Cake Boss,” hosted the highly anticipated ceremony. 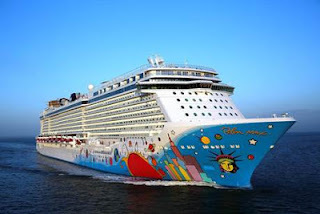 Throughout the christening ceremony, which was simulcast in ten venues thoughout the ship, Norwegian Breakaway’s spectactular onboard amenities and entertainment were showcased in front of more than 4,000 guests. From live performances by Slam Allen, Howl at the Moon, Cirque Dreams & Dinner Jungle Fantasy, along with Burn the Floor and a show stomping finale featuring Rock of Ages, Norwegian Breakaway, the largest ship ever to homeport in Manhattan, kicked off its arrival to New York City in style. Norwegian Breakaway will begin her weekly seven-day cruises to Bermuda, throughout the summer, on Sunday, May 12 with a special guest onboard, Kevin Sheehan, the line’s Chief Executive Officer. From October through April, Norwegian Breakaway will offer seven-day voyages from the heart of Manhattan to the Bahamas and Florida, as well as two 12-day sailings to the Southern Caribbean. Newly Refit Royal Caribbean Grandeur of the Seas Arrives in Baltimore. Royal Caribbean's Grandeur of the Seas arrived at the Port of Baltimore, Maryland on 5/3/2013 to replace Enchantment of the Seas. Grandeur will offer six- to 10-night cruises year-round and will offer passenger cruises to Bermuda, the Bahamas and the Eastern and Western Caribbean, as well as Canada and New England. This is the second time Grandeur of the Seas has been based out of Baltimore. She previously was deployed to the port from 2004 through 2009. To celebrate Grandeur of the Seas' return to Baltimore, Governor Martin O'Malley declared May 3, 2013 as "Royal Caribbean Cruise Day" in Maryland. Grandeur of the Seas is fresh from a $48 million bow-to-stern revitalization, which incorporated six new specialty dining options, technological upgrades and new entertainment features, as well as a refresh of all furniture, carpet, upholstery and staterooms. Families with toddlers can take advantage of the newly installed Royal Babies and Tots Nursery, which caters to the cruise line’s youngest guests, ages six months to 36 months. Guests can also enjoy a 220-square foot poolside movie screen and take in a new high-flying experience whereby aerialists glide through the ship’s six-story atrium. Royal Caribbean is offering a variety of itineraries to Bermuda, the Bahamas and the Eastern and Western Caribbean. 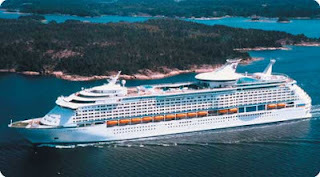 In the summer, the itineraries alternate between seven-night Bermuda sailings, featuring a two-night call at Kings Wharf, and seven-night sailings to the Bahamas, calling at Port Canaveral, Florida; Nassau, Bahamas; and CocoCay, Royal Caribbean’s private island paradise in the Bahamas. In the fall, Grandeur of the Seas will alternate between six-night Bermuda and eight-night Canada and New England sailings. The winter season will consist of rotating 10-night sailings to the Eastern and Western Caribbean, as well as eight-night sailings to the Bahamas. 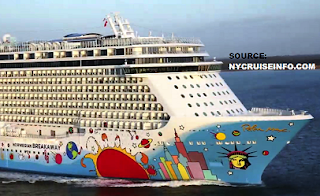 Following months of anticipation, Norwegian Cruise Line’s newest ship, Norwegian Breakaway, arrived early this morning to her year-round homeport of New York City. The 146,600 gross ton ship, which is the largest ever to call Manhattan its home, will be christened on Wednesday, May 8 during an exclusive ceremony featuring New York City icons The Rockettes®, Chef Geoffrey Zakarian, Master Baker Buddy Valastro, star of TLC’s “Cake Boss,” and New York City officials, among others. Her signature hull art, designed by legendary artist Peter Max, is highly visible from the Manhattan Cruise Terminal’s Pier 88. On May 12, she will sail to Bermuda to start her series of seven-day cruises through October. In the fall, Norwegian Breakaway will offer seven-day voyages from the heart of Manhattan to the Bahamas and Florida, as well as two 12-day sailings to the Southern Caribbean. 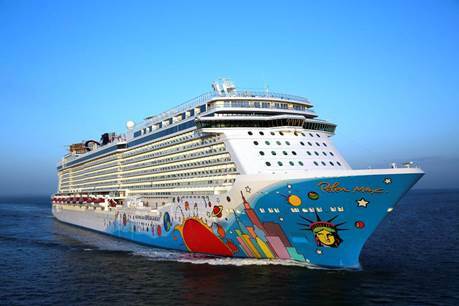 Having been on the design board for years and assembled in just over one year - Norwegian Cruise Line's New Norwegian Breakaway is ready to sail. The ship is was turned over to NCL from her builders Meyer Weft of Papenburg, Germany on April 25th in Bremenhaven, Germany. The Norwegian Breakaway Maiden Transatlantic Voyage will depart from Southampton, England on April 30th at 5:00 PM and arrive in New York. 7 days later on May 7th. Entering New York Harbor under the cover of darkness, the Norwegian Breakaway is now scheduled to arrive under the Verrazaro-Narrows Bridge around 3:30 / 4:00 AM on May 7th. After a series of short cruises for the media, press and special guests, the Norwegian Breakaway will settle into 7 day cruises to Bermuda in the spring. summer and fall and Florida and the Bahamas in the Winter.